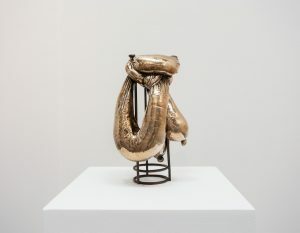 We have collaborated with the artist to produce a bronze limited edition titled WE THE PEOPLE, coated in 24kt gold plating for which this one off hand carved sculpture is the study. Much of Carlos Rolón’s work explores the politics of style. He appropriates and reconfigures the ways in which personal, domestic, and public modes of expression serve to construct and define identity, as well as to resist and defy dominant culture. 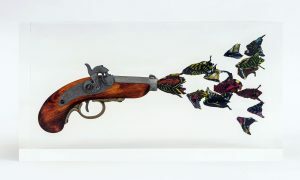 Rolón is interested in the exaggerated, neo-baroque of street style and the vernacular of domestic material culture, in particular, those emerging from Latin America and the Caribbean and their diasporas. These aesthetics—whether drawn from nail art, home interiors, or custom car culture—are often gestures of hyper visibility, offering a declarative and trenchant spectacularization of presence. Rolón’s exploration of these forms, which he employs and remixes through a lens of art history and socioeconomics, interrogates notions of authorship, value, and taste. Rolón’s WE THE PEOPLE (AfroComb) grows out of this interest and is a consummate example of the critical entanglement of politics and style. 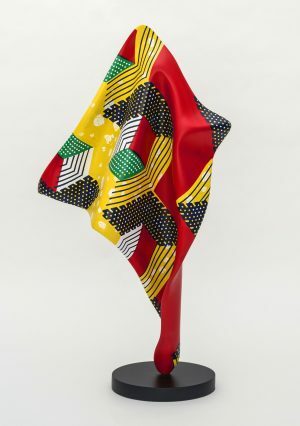 An oversized golden afro pick crowned with a black power fist, WE THE PEOPLE (AfroComb) transforms a political tchotchke into a glorified object. 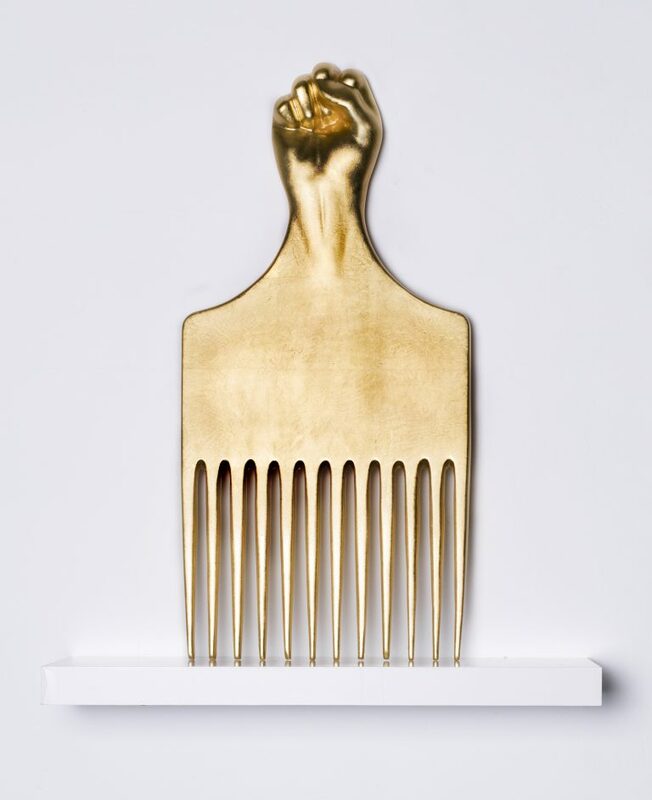 This particular style of comb, made popular during the height of the Black Power movement in the 1970s, represented an embrace of new styles that made manifest the mantra “black is beautiful,” and the embellishment of the raised fist only reinforced the marriage of style and radical politics in that moment. 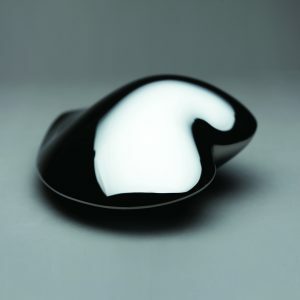 Mass produced consumer goods like the comb that Rolón takes as his subject can—especially in the commercial culture of the late 20th century—become potent symbols in spite of, or perhaps because of, their ubiquitous nature as “cheap and easy” objects that are widely available. And, like religious icons, tokens of the revolution can be kept close and worn on the body—an outward and everyday signifier of one’s convictions and participation. WE THE PEOPLE (AfroComb) embodies Rólon sensitivity to the way in which artifacts of material culture always carry with them complex significations, bound up in history. Based on a previous large-scale work realized in hot pink, this new smaller-scale golden edition elevates an intimate effect of identity, and points to the multivalent politics surrounding the body and hair in particular. This object is made precious and literally placed on a pedestal—physically manifesting the critical symbolic value we might ascribe to this once small plastic trinket. Shining like an altarpiece, Rolón’s work makes tangible the necessary and powerful coalescing of politics and style.